A quick, healthy and delicious dish that can be served on its own or with rice. Perfect weekday dinner or weekend lunch. 1. Heat 1/2 tblsp of oil in a frying pan. 2. Saute the tofu pieces for a minute or until golden. 3. Remove and keep aside in a warm place. 4. To the same pan, add the remaining 1 tblsp oil. 5. Stir-fry the onions and carrots for a minute. 6. Add the cauliflower, capsicum and saute for another minute. 7. Add the zucchini (if using) and peas. 8. Mix the soy sauce and sweet chilli sauce with 1/4 cup of water. 9. Add this to the pan with the tofu. 10. Stir well and cook for a minute. 12. Garnish with coriander leaves and serve with rice. Tip: You can also garnish with toasted cashew nuts if desired. 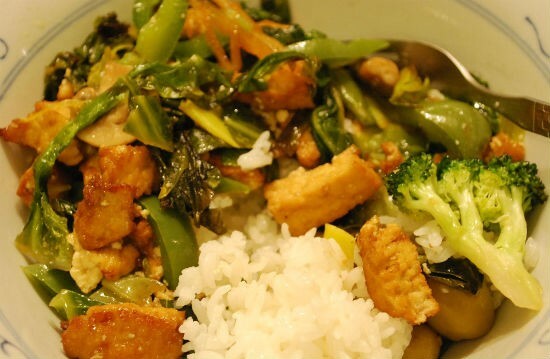 Feel free to comment or share your thoughts on this Vegetable Tofu Stir-Fry Recipe from Awesome Cuisine.